If you are like me.. the idea of traveling without a firearm leaves you feeling naked and vulnerable, especially when traveling with loved ones. If you are flying and hesitant to bring along your handgun don't be. The process is really simple. What is required to fly with a firearm you ask? Well the short is that you cannot fly with a firearm, but you may properly store your locked and unloaded firearm in a locked box that meets TSA airline firearm guidelines, and place it in one of your check in bags. We chose the GunVault Nanovault 200 that we purchased from amazon for something like $25, there are dozens of options really. It securely fit a full size pistol and a small box of ammo. We suggest slide locking the gun in the open position just like you might do before entering a shooting range. You then must "declare" the firearm when checking your bags. 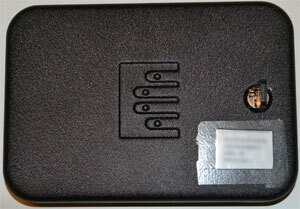 The agents will ask you to unlock your case and they will visually inspect and see that the gun is unloaded, and then place an orange sticker on the case. You will be asked to sign a form as well. Again make sure your setup meets TSA firearm guidelines. 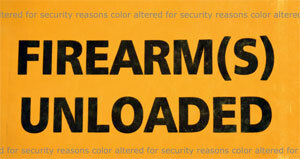 URL to official TSA page http://www.tsa.gov/traveler-information/firearms-and-ammunition. While the TSA may be overextending it's reach and infringing on our rights by forcing body scans they are at least doing it with a smile, and if you meet their criteria there should be no issue. We spoke with a TSA agent while she was checking swabbing the inside of our luggage containing gun vault for residue, and she confirmed it's a common practice that they deal with every day. The biggest problem they have is that airline agents often put the "unloaded firearm sticker" inside the locked gun case. When they do this and the item shows up on a scan they are not able to tell if the firearm is indeed unloaded since the sticker is in the locked case. If you have any questions or comments please just post them below and will try to help push you in the right direction. Hope this article helps keep you safe on your next vacation, I can tell you we slept better knowing we were protected by our 2nd Amendment, and this is no overstatement. It's nice to live in a country like the United States where they recognize our god given rights to protect what's ours. God Bless America!